Fanny Blake is a freelance journalist and writer. She was a publisher for many years editing both fiction and non-fiction. Since then she has written various non-fiction titles, acted as ghost writer for a number of celebrities, and is a former books editor of Woman & Home magazine. 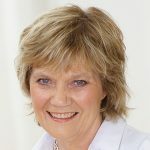 She has been a judge of a number of literary prizes, including the Costa First Novel award, the Desmond Elliott Award, the RNA Romantic Novel of the Year award and the British Book Awards. She is also the commissioning editor for Quick Reads and a book reviewer. She has written eight novels, including An Italian Summer and will be launching her latest book, A Summer Reunion, at the Festival.